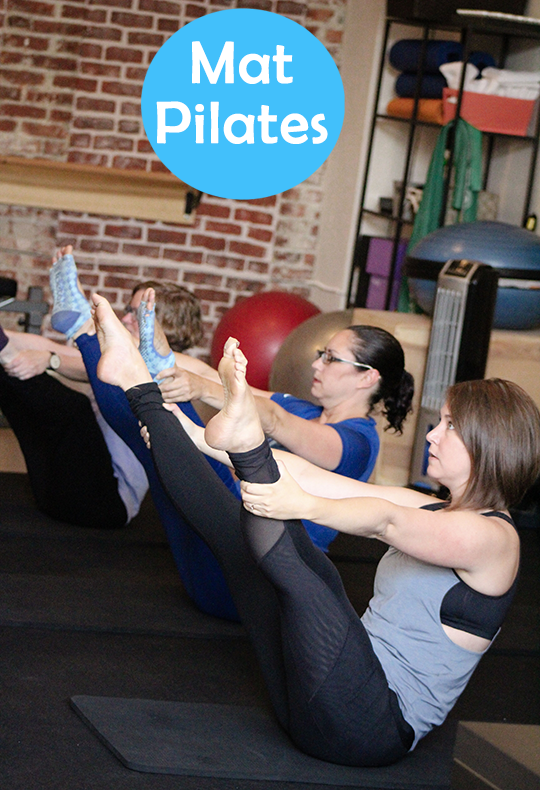 Generally, the goal of a Mat Pilates class is to strengthen the body’s “powerhouse,” a Pilates term that refers to your abdominals, lower back muscles, pelvic floor, hips and glutes. Through a series of floor exercises using resistance bands and rings, the workout helps build, sculpt and tone these muscles, giving your body a long, lean look. Mat Pilates can aid in flexibility and improving posture, as stretching your body is a vital part of class. While low-impact, Mat Pilates burns fat during and after class, as your muscles continue to shed calories long after class ends. Focusing on your breathing plays a major role in Pilates. You breathe from your belly instead of your chest, Pilates connects your breath to the exercise, allowing that influx of oxygen to better complete each movement. Since you are concentrating so strongly on breathing deeply, the mind can benefit from mindfulness, relaxation and stress reduction during and after class. Over time, your mind becomes trained to stay more focused not only while working out, but also in your everyday life. Those who practice Pilates often reap the benefits of these deep breathing exercises, suffering less from anxiety, anger and even depression. SO TRUE! You have only have one body, so make it strong! Join Innate Vitality and join the community! We offer small classes accessible to everyone at any level of fitness and you get personalized attention. Come check out our classes! We’re offering an August special so a FOR A LIMITED TIME if you sign up a 5 month unlimited membership and you get the 6th month FREE! That includes not only unlimited Mat Pilates, but unlimited classes for Barre, Zenga, Yoga, Strength Training and Reformer Pilates.